East Acton Primary School "Growing Together"
Welcome to the Year 3 Holly Class page! Here you will find what we’ll be learning in class in the week ahead, examples of learning that have taken place, links to useful websites, resources for home learning, photos of activities and events and much much more! Be sure to check this webpage every week; you could even set it as your homepage! PE - Autumn term PE days will be on Thursdays. Please remember PE kits, with all items of clothing (and shoes) clearly labelled with your child's name. Homework will be given out on a Friday and should be handed in the following Wednesday. This week we have been getting to know each other in Holly Class, as well as establishing our class rules and expectations. We talked about ways that we respect others at school and home, all agreeing that we should "treat others the way we want to be treated". Not forgetting that we are all unique and special in our own way. This term we have been learning about place value - hundreds, tens and ones. We have used dienes and coins to help us represent numbers in a variety of ways. We are practising how to add 1, 10, 100 more and 1, 10, 100 less. We are understanding which digit changes and giving reasons why. Now that we have had a nice break, we are ready to get back and prepare for a busy term leading up to Christmas. This term we have started reading "The Owl Who Was Afraid of the Dark". We are learning about narratives and planning to write our own version of this story. Please use the link below to read the book at home and discuss the characters, setting, problem and resolution. We are learning about addition and subtraction this term in Maths. We are adding multiples of 100 and starting to use part-whole method and bar method to help solve problems. We have been practicing our number facts up to 100 using inverse relationships. Use the link below at home to help master this skill. This term, we are learning about the Stone Age to Iron Age. This week, Holly Class became a large cave and everyone acted as cave people who were creating cave drawings. We are all interested to learn more about history and discover more about Stone Age people. Please use the link below to find out some more information. At the end of this term, we are going to perform a poem at assembly as a whole class. We are practicing this poem in class, but make sure that you practice it at home as well. We will be allocating students to say different verses at a later date, but for now, everyone will be learning the whole poem. Please see the links below to practice at home. 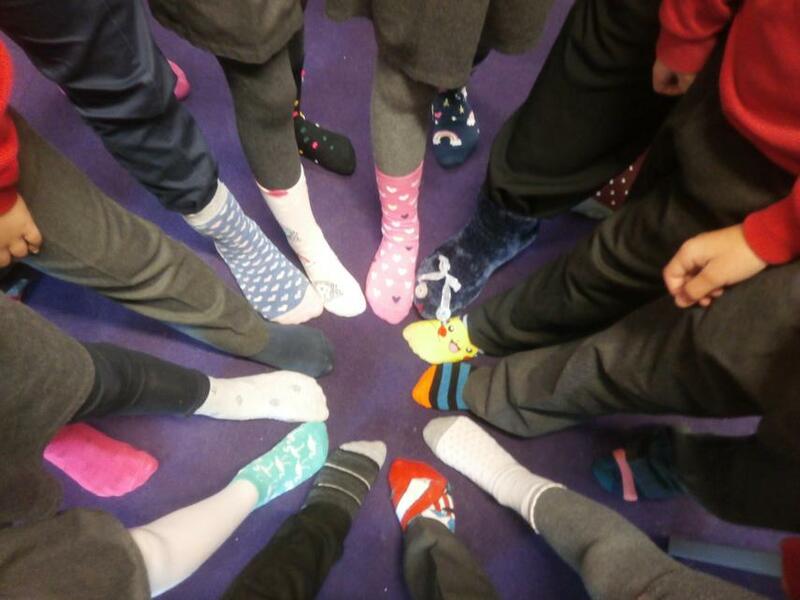 This week (Monday 13th - Friday 17th) we are celebrating that we are all unique and different. We have been discussing our likes, dislikes and all the special things that make us unique. There is a song that we have been listening to - please use the link below to sing along at home. There are also links below for some top tips for dealing with bullying. Arrrr matey!!! Last week, our school was taken over by pirates! Our classrooms were transformed into pirate ships and we learned all about pirates. We read a book called "The Night Pirates" and wrote some great narratives. Please see the link below to listen to this book and discuss the events that happened in the story. at school and Holly Class are performing "Frosty the Snowman". Please practice the words at home to help us prepare for this event. Holly class have chosen to raise money for Wood Green - The Animals Charity. Their vision is living in a world where all pets are cared for in loving homes for life. We are selling cakes and snacks during the week starting 22nd January - 26th January. Please explore the link below to learn more about our charity. How well do you know your 4 times tables? Use the song in the video below to practice your 4 times tables!! In Literacy, we have been learning about descriptive writing using the book Fly, Eagle, Fly. Everyone has enjoyed reading this book and finding the new meaning of new words. We have been creative in our writing by using similes, metaphors and powerful adjectives. Watch the link below to listen to the book. Do you know your 8 times tables? 8 Times Tables - Have Fun Learning! Remember to be as creative as you can be! Remember to practice your lines! We are performing on Tuesday 27th March.